This week 3DR released the iOS and Android apps to take advantage of the last Solo Arducopter release which finally allows control of the GoPro in flight to change settings such as shutter speed. This release only offers NTSC settings with PAL settings to come in a future update, hopefully fairly soon. Recent firmware releases have seen improvements to the GPS, the video transmission range, to the gimbal and to the handling in flight. We haven’t used the latest firmware long enough to say for sure, but the Solo feels smoother in flight and the video looks more locked in as a result, we’ve not yet seen any micro-vibrations. Especially in high winds it was possible previously to see a subtle vibration in video and although this is easily dealt with in post it would be better not to have to. Smart Return Home: Solo won’t climb as high to return if it’s close to home. Solo will always climb a minimum of 2.5m. 3DR has announced that future firmware will integrate with Airmap to provide information on flight restrictions and prohibited airspace, it is believed this will be informational only and will not disable flight as there are cases (for example approved commercial operators) where there would be legitimate reason to fly in airspace close to an airport. 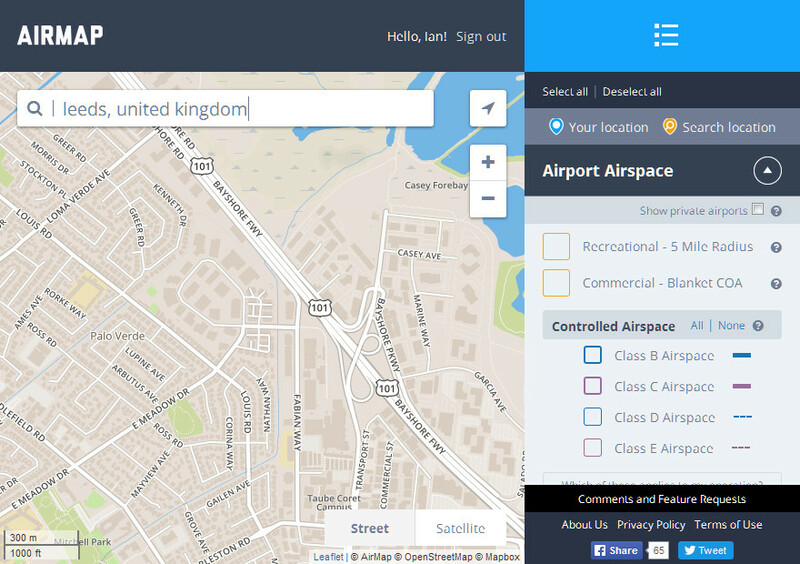 The Airmap service only supports US airspace at this time and does not recognise UK addresses. For example, Leeds, which once had a respected football team cannot be found on Airmap. We’re told future versions will work internationally.